We sponsor a trip to the seaside! Just one of the ways we celebrate 10 years of building peace. On 5 August 2015, our affiliate Humans Without Borders brought 57 Palestinian children and 30 parents to the seaside, supported by a Children of Peace grant. Our tenth anniversary theme is Music for Peace. We will be raising funds for creative and cultural centres in Israel and Palestine including the Edward Said Music Conservatoire in Gaza, Beit al-Musica and the Arab-Jewish Youth Orchestra in Israel. We’ve just opened our new eBay shop and this December we plan to hold an auction of rare and collectible items donated by our celebrity supporters. Please look out for it. Our lead story is deeply moving. 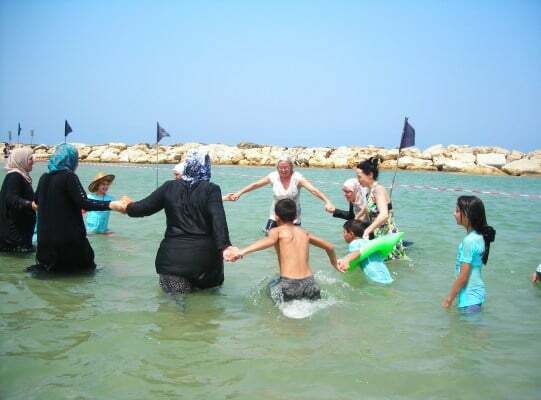 In partnership with Children of Peace, affiliate Humans Without Borders brought dozens of sick and disadvantaged landlocked Palestinian children and their families to experience an unforgettable day at the seaside. It makes all our hard work over ten years so worthwhile to see the children so happy. In other news the distinguished actress Emily Watson OBE joins us as a Friend; Earth Caravan affiliates within our Coalition of Peace. 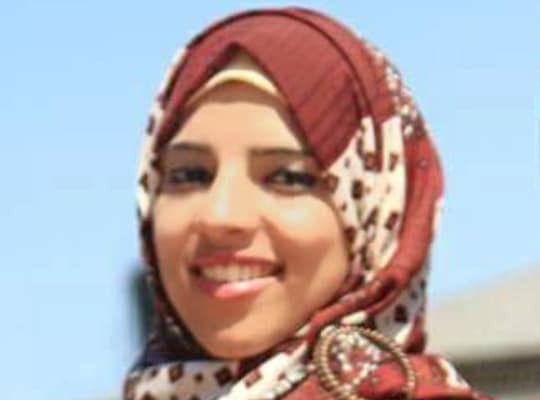 And our regular contributor Dalia Al-Najjar – writes about her life in her Letter from Gaza. This August, one of Trustees Antonia Leslie spent several weeks on a field trip to Israel and Palestine. Her report highlights the importance of our work against a background of seemingly unending regional conflict. Dominic Martin looks at our successful London 10K Run. Michael Regan – our fundraiser – writes in appreciation of our recent grant from Lush, the UK retail chain. This will help us in our support for women’s empowerment groups in Israel and Palestine. Our Interview this issue is with Tori Egherman, an American activist and journalist. She was one of two bloggers at View from Iran, and has also written about Iran for Tehran Bureau on The Guardian and Global Voices. Sharing our tenth anniversary along with our many thousands of supporters worldwide are our Patrons, Friends and Ambassadors who send their greetings. Reaching our tenth anniversary, we have much to be proud of. Please continue to help us to help the children. In August, Trustee Antonia Leslie, made a field trip to meet affiliates and supporters in Israel and Palestine. We are proud to welcome a new affiliate – the Buddhist inspired global community Earth Caravan/Tao Sangha. In this latest interview, Professor Sarah Brown talks to Tori Egherman, an American activist and journalist. Children of Peace’s Alice Braham is a winner of the British 10k London run! See the story. The Children of Peace Team is proud to welcome actress Emily Watson OBE, as a Friend of Children of Peace. We are the recipient of a grant from Lush – a UK high street network of stores selling handmade cosmetics. In the latest of her despatches from Gaza, Dalia looks at how creative music can bring about change. Latest positive news from the region including about a joint summer camp for Arab and Jewish children. Our research has shown that Palestinian children in the landlocked West Bank dream of visiting the seaside. On August 5 2015, our affiliate Humans Without Borders brought 57 sick and disadvantaged Palestinian children and 30 parents to the seaside, supported by a Children of Peace grant. 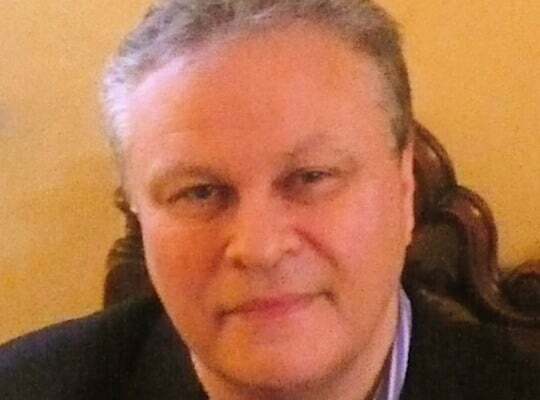 Below, one of the organisers Larry Lester tells us about that magical and memorable day. See too the full video clip here on YouTube. It was produced and edited by Maayan Selma. For which we thank her sincerely. On 5 August, Humans without Borders, with the support of Children of Peace took two busloads of Palestinian families to the Tel Baruch beach north of Tel Aviv. What is unique about these families is that each has at least one very sick child requiring intensive medical attention in an Israeli hospital. In all, we took 57 children to the event – children under treatment, brothers and sisters and about 30 parents. Several were unable to make the trip due to hospitalisation or illness or the fact that we were unable to get them permits from the military government. We put together a major support team of about a dozen Humans without Borders volunteers and a few of their teenage children, 10 youngsters from the villages of Abu Gosh and Ein Rafa (west of Jerusalem), a half dozen students from ‘Hand in Hand’ bi-national school in Jerusalem and a volunteer nurse, all of whom are Arabic speakers. Their interaction with the children was immediate and extremely positive and was a major factor in the huge success of the day. The meeting points were two Israeli military checkpoints – Bethlehem (south of Jerusalem) and Kalandia (north of the city). The excitement was amazing. We set the departure time at 9.00am but the first call I received was at 7.30am from a family from Jenin (two and a half hours north of the checkpoint) that they had already arrived at Kalandia. As soon as the buses arrived, the families were onboard and ready to go. The Beach The Tel Baruch beach is a magnificent location with a breakwater and massive stretches of sparkling sand. Dana Cohen, the Humans without Borders volunteer who managed the event, arrived early in the morning and set up 24 beach umbrellas to provide shade for the families. We called it a Palestinian settlement in Israel! It was quite amazing to see the reaction of many of the parents who had never seen the sea until yesterday. They were simply stunned by the expanses and the distant, unending horizon. This is exactly as one woman described it to me. The kids were in the water before we could get them coated in screen block and, after a bit of convincing, the parents followed. 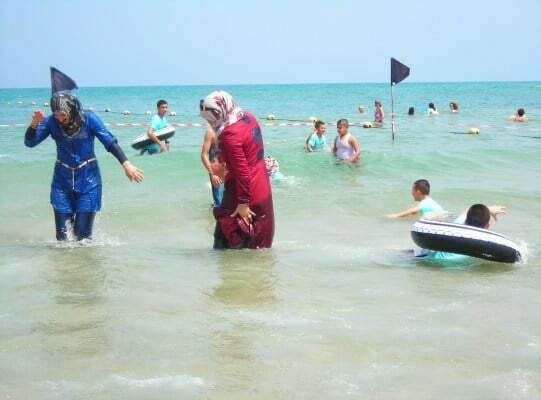 From a social and traditional perspective it was fascinating to see how fully-clothed Palestinian women enjoyed themselves as much as Israeli girls in bikinis. Everyone was frolicking in the water. We brought along, tubes, balls, pails and shovels and such so the only thing the kids complained about was when we pulled them out of the water to eat. Food Dana brought along a selection of baked goods for breakfast and tons of watermelon and we had ice pops to make sure they were getting sufficient fluids. Lunch was delivered by a woman from Jaffa who prepares traditional Palestinian food. It was delicious and nothing remained except for empty containers. The Heat It was a very hot day, in spite of the fact that the temperatures had dropped from around 40 to about 33 degrees. It was crucial that we consider the time the children would be exposed to the sun. Thus we vetoed several of our initial ideas such as a boat trip or a kite project. It was simply too dangerous to have them in the fierce sun for so many hours. At about 3.30pm we called it a day – much to the chagrin of several of the boys. Everyone showered in fresh-water showers on the beach and we were on our way back to a much harsher reality. Children of Peace This event could not have been possible without the generous support of Children of Peace. Many people – Israelis, Palestinians and a Dutch couple – asked just what your logo was doing on the shirts and I explained what our organizations do and the support you provided for the day at the beach.” Special thanks go to Salametcom, an Israeli Arab organization with which Humans Without Borders works very closely. They arranged for the girls from Abu Gosh and Ein Rafa who joined the Seaside Project for the day. Humans without Borders in Jerusalem, who coordinate a large number of Israeli volunteers using their own cars to ferry Palestinian families with severely ill children from checkpoints to good hospitals in Israel. It was a humbling experience accompanying one of the volunteers (a lovely lady called Hadassah) picking up a little Palestinian boy, Amil, and his father to take him for kidney dialysis which he needs to survive. Without her help and the help of other volunteers the journey would be impossible for Amil and his father to make every day. Hope Flowers School in Bethlehem, a wonderful school run by the inspirational Ibrahim Issa, surrounded by settlements, fearful of land eviction, but determinedly continuing its important work offering Palestinian children a good education, as well as much needed occupational and trauma therapy. Term had not yet started but walking around the cheerfully painted school building I could feel what a sanctuary it must be for children living in the area. Rabbis for Human Rights, who run summer schools and improve classroom facilities for children in impoverished refugee Bedouin communities in the West Bank. I went to visit some of the villages where the schools are cheerful but makeshift. Unfortunately, I just missed seeing the summer schools (which Children of Peace supported with a grant this summer), but I got the impression they made a big difference to these children who really have very little. The Arab-Jewish Community Center in Tel Aviv – a thriving, growing activity centre (the only public one in Israel) to promote and actively encourage Arab-Jewish tolerance for children and adults. It sounded like they have a big impact in Tel Aviv; hopefully they might influence other centres to open and an ethos of mutual respect to ripple throughout the region. I believe it is especially important to protect, educate and open the hearts of children living in a world full of sniper towers, walls, distrust and fear. Seeing for myself a diverse range of incredible affiliates, all striving in their own way towards the same goal (greater peace, stability and happiness in this troubled land), made me glad that Children of Peace exists to help each and every one of them. Long may their admirable efforts continue. All the children in Israel and Palestine deserve to live in peace and security, free from the uncertainties of conflict and random acts of violence. Children of Peace is an important place of safety for the children and their message is one we all need to hear to bring about the change everyone is hoping for. I passionately support their work and I am proud to be part of it. Emily received an OBE this year for her services to drama. Emily was most recently seen leading the cast in BBC One’s A Song For Jenny, a TV movie based on Julie Nicholson’s book about her daughter, who tragically died during the 7/7 attacks in London. Later this year, Emily will be seen in Richard Eyre’s The Dresser co-starring Sir Ian McKellen and Anthony Hopkins. In October 2015, she will star in Universal Pictures project Everest co-starring Jack Gyllenhaal, Robin Wright and Keira Knightly. Emily starred as ‘Beryl Wilde’ in the award winning The Theory of Everything, alongside Eddie Redmayne and Felicity Jones. She was also seen in James Kent’s Testament of Youth, based on Vera Brittain’s First World War memoir and in May 2015 Emily portrayed ‘Queen Elizabeth’ in V.E. Day celebration film A Royal Night Out. A veteran of the London stage, Emily’s theatre credits include Three Sisters, The Lady from the Sea, and The Children’s Hour at the Royal National Theatre. She has worked extensively with the Royal Shakespeare Company, in such productions as Jovial Crew, The Taming of the Shrew, All’s Well That Ends Well, and The Changeling. Children of Peace is proud to welcome a new affiliate – the Buddhist inspired global community Earth Caravan/Tao Sangha – which joins our Coalition of Peace, the single, largest peace network across the Middle East and now growing worldwide. Tao Sangha is a global community of people who believe and promote a way of living based on Buddhist principles of compassion, empathy and spiritual development for all beings. Founded in 2001 by Buddhist priest and founder of Tao Shiatsu Ryokyu Endo, the Tao Sangha International network links branches in Japan, Europe, Canada, and the United States. Tao Sangha is at once a Buddhist Temple, a Tao Shiatsu Clinic and School, and a non profit organization run entirely by volunteers with the wish to unite peoples and cultures beyond the differences of religion and ideology, nationality and ethnicity. Children are at the heart of Tao Sangha. Since 2010, Tao Sangha has been supporting children’s education in three Rakhaing (Buddhist minority) villages in Bangladesh. Through the Earth Caravan project, Tao Sangha honours and supports the wishes of children through our Wish For the World campaign and by raising funds to support Jewish-Arab kindergartens in Israel and children’s aid projects in Gaza. Tao Sangha centres in Montreal, Canada and Madison, Wisconsin also give support to street youth and the homeless. Tao Sangha shares and fully supports Children of Peace’s non‐partisan principles of inclusiveness, trust and friendship building, regardless of community, culture, faith or gender. We also support and share the belief in the power of the grassroots to enact change through shared experiences and projects aimed at overcoming suspicion, mistrust and fear. We wish for children in the Middle East and the world over to be able to grow up in safety and comfort, happiness and security. Children of Peace is delighted to announce that we are the recipient of a grant from Lush – a UK high street network of stores selling handmade cosmetics. They are known and admired for their ethical approach to business and the sourcing of products. Lush are long-time campaigners against animal testing and since creating their Charitable Foundation in 2007 they have donated over $10,000,000 to 850 grassroots charities in 42 countries. Michael Regan – fundraiser for Children of Peace – outlines how the grant will help towards empowering disadvantaged women in the region to become more economically independent. Women comprise just 12% of the Palestinian labour force, yet outnumber men by 50% in the universities. They remain inherently more vulnerable to the economic ramifications of conflict. We believe that the best route out of this marginalisation is to empower women to become economically independent and take control of their own lives. Not only do women reinvest 90% of their income back into the health and education of their families, but the spirit of trust and cooperation between Palestinian and Israeli women can serve as a benchmark for the children born into conflict. We are delighted that Lush has chosen to support conflict resolution in Israel and Palestine and Lush for their invaluable support. Children of Peace is extremely grateful to Lush for their generosity. Children of Peace adheres to the UN Millennium Goals and in particular Goal Three which focuses on gender equality and empowering women and girls. This grant will help towards making that happen. In this latest interview, Professor Sarah Brown talks to Tori Egherman an American activist and journalist. She was one of two bloggers at View from Iran, and has also written about Iran for Tehran Bureau on The Guardian and Global Voices. She is currently the editor of The Civil Society How-To and Communications Director for #TEDxAms. Sarah Brown: The Iran deal has met with polarised responses. What is your own view? Tori Egherman: I support the agreement. The older I get, the more radically attached to peace and diplomacy I become. The agreement goes a long way to ensuring that Iran does not get a nuclear weapon and that it becomes an active member of the world community. I think that’s a good thing. I am also happy that blanket sanctions will be lifted. When I lived in Iran, I saw for myself how sanctions gave hardliners power as well as cover when it came to answering for economic malfeasance. “What do we need sanctions for when we do such a good job sanctioning ourselves,” I heard Iranians say many times in one form or another. One friend even reported that when she asked a local supermarket owner when he would have more chocolate milk in stock he shrugged and said he didn’t know. Sanctions, he told her, were to blame for the lack of chocolate milk. I’ve written about my support for the agreement on Harry’s Place twice, once in April when the framework was announced and once in July after the final negotiations. Sarah Brown: Many have sincere worries for Israel’s security. How would you try to allay those fears? Tori Egherman: When I lived in Iran, I kept a blog. Iranians used to send me emails asking me why Israel was threatening them. Sometimes I would point out that Iranian missiles were paraded with anti-Israel slogans on them and that the rhetoric was not one-way. I write this to point out that the fears exist on both sides of the divide. Iranians and Israelis are populations familiar with war. It isn’t a hypothetical threat for either country. Many in Israel’s security establishment have come out in favour of the agreement. If they cannot convince people concerned with Israel’s security, I cannot, that’s for sure. The fears are deeply ingrained. Sarah Brown: What are the commonest misconceptions held about Iran? What most surprised you about the country? …that the Iranian population is filled with obedient sycophants, who goosestep to the sound of “Death to America.” The second biggest misconception is that Iranian women are simply victims of an oppressive patriarchy and that only we emancipated Westerners can save them. What surprised me most was realizing that aspects of the culture I grew up in as the granddaughter of Eastern European Jewish immigrants to the USA, could be found in Iran. For instance, in Yiddish you insult to compliment. In Persian, you compliment to insult. Yiddish speakers often rhyme a word with a nonsensical version: guilt, schmilt; boyfriend, schmoyfriend. Persian speakers do the same: yachtjal, machtjal…When people in Israel were joking about a postage stamp with Ariel Sharon’s face on it, people in Iran were telling the same joke about Mahmoud Ahmadinejad. (They didn’t know which side of the stamp to spit on, goes the punchline.) Nearly every Iranian mother wants to see her son (and in some cases, her daughter) grow up to be an engineer or a doctor. Mothers and grandmothers rule the roost. Education is valued, even revered. In fact, female participation in university was at 60% when I lived in Iran from 2003-2007 and the top high school students in math and science were girls. A Jewish Dutch author who just finished a book on Iran echoed my impression. She said that she felt so comfortable in Iran stating, “You don’t know where the tears end and the laughter begins.” It’s true. The feeling of shared culture is deep and powerful. I fell deeply in love with Iran in a way that astonished me, as though some ancient part of me had been reawakened by the land and the people. The most common misconceptions come from trying to understand a country from the news you read about it. When I speak to young students about my time in Iran, I ask them first to do a mental exercise about what they would know about their own country if they only read about it in the news. Iran is a dynamic place with a dynamic culture. When thinking of Iran’s population, it’s useful to recognize that most people experience a disconnect between the world inside their homes and the world outside. In many societies, this is something common only for minority populations. In Iran, even the majority experiences this. As a result, they question everything they hear. It’s rare to find anyone in Iran who simply believes what they hear on the news or from the mouths of their leaders. Sarah Brown: Tell us something about your work with the progressive MENA organisation Mideast Youth. …way back in the early 2000s, I was living in and blogging from Iran. At that time I wrote for them and later helped Mideast Youth grow to a larger organization by introducing them to funders. I strongly believe in their work and their mission, and I do everything they ask me to do, which is not so much anymore. The best aspect of the internet is the platform it gives for those who want to practice democratic communication and reach out to people across our ‘tribal’ borders. Mideast Youth does just that. Sarah Brown: Israel and Iran both come under fire for their treatment of minority groups – not always from the same people. Do any parallels or contrasts strike you? Tori Egherman: Yes. I believe that justice is at the heart of long-term peace. Justice can never come without respecting basic human rights. I see that there are people in both countries working to improve the rights of minorities, which is heartening. But the fact is that in systems with foundations in religious law, equal access to justice is limited by structural obstacles. Both Israeli Jews and Iranian Shia Muslims have only a few decades of experience exercising state power. Both still feel existentially threatened. And both will have generations of reparations to make if they don’t begin addressing access to justice and basic rights for their minority populations. I know much more about Iran than I do about Israel. It’s distressing that Iran imprisons so many of its activists for human rights. Their plight and their work has made me much more aware of issues of justice and access to rights everywhere. Democracies should be judged by how well they treat their minority populations. This means that democracies will always and should always face harsher criticism than authoritarian governments. Sarah Brown: You have experience of living in three countries, the US, Iran and the Netherlands. Are there are particularly telling differences/similarities in the way the people/media in these countries discuss Israel/Palestine? Tori Egherman: That’s a good question. Everywhere I live people tend to think one group or another is not getting fair coverage. Pro-Israel folks think Israel gets a raw deal. The same can be said for pro-Palestinian folks. Iranians have state media, which is anti-Israel, yet people in Iran seem less engaged and less polarized than people in the Netherlands or the US. The idea that there are actual people with rich and complicated lives on both sides of the divide seems to be sorely lacking everywhere. Discussion is difficult and painful with both sides digging in deeper while common ground shrinks to nothing. As a Jew myself, I know that I sometimes become defensive of Israel. It is painful for me to look at the abuses of basic rights for Palestinians. It would be so much easier to ignore them and believe that everything is fair and wonderful. I have to remind myself all the time to listen to the stories of my Palestinian friends, to acknowledge their right to their own pain. The stories of Palestinians and the stories of Israelis should be able to co-exist. One cannot cancel out the other. In the latest of her regular series of despatches from Gaza, Dalia Al-Najjar focuses on her life and the everyday reality of the Strip. Here she looks at how creative music can bring about change. “You are not in America anymore, shut up” was the first line my friend told me when we were at the Jordanian check out point in our way to Gaza after spending six weeks in a leadership exchange programme in the United States. She meant to remind me of our almost never-given right of freedom of expression. We had paid for a VIP ticket to get to Gaza as fast as possible and with less hassle. I handed my passport to the officer sitting behind the window with two others. He took the passport and barely glanced at me. Then he began to tell his colleagues a story as if I were invisible. I got angry. I didn’t want to wait more time, I was so tired. He still didn’t look at the passport and few moments passed before he looked up and said with emotionless passive voice “go have a seat”. Seats were the biggest advantage of the VIP ticket. Feeling miserable for being ignored and having your time wasted is a one awful thing but not being able to express your anger about it is another awful thing. I tried to cool myself down with some music. While shuffling “What’s Going On?” started up – a rap song from the Revolution Makers, a Gazan rap band (pictured above). It was amazing how the song provoked my thoughts. It was inspiring how they express the problems in our society in a lyrical, musical way. Their voices and words were strongly directing every part of you toward change. The band name is a literal definition of their unique art. In an environment where people are busy figuring out how to survive effectively and efficiently, thinking of ways of expression isn’t in most people thoughts – even though it’s very important. Mohammed Elsusi, who together with his brother Osama, formed the Rap duo Revolution Makers in 2009 are creatively challenging not only the circumstances following the last war but also the culture and the community . They started in a time and a place of no audiences and they kept going gaining admiration and acceptance along the way. Their goals and messages were clear, they wanted to tell our story in the way they understood it. They want everyone to know that we are way more than victims. They smuggled hope in all of their songs. A lot of people call Gaza “the graveyard of talents and ambition” but the Revolution Makers proved all the doubters wrong. They shone through the darkness, directing the lights on the root causes of the community problems. Inviting everyone to suggest a solution and to start making change by changing themselves. They have 14 songs so far. However, they haven’t been able to release their first album yet as they cannot afford to. The Elsusi brothers are still students who save from their allowances to record the songs and shoot the musical videos which hold them back because they can’t record whenever they are ready, they have to wait for the money. They make their own music and they feature other local and international singers. Many fans across the world had asked for CDs and the brothers are looking for some support to make it happen. With scarce resources many stars shined in Gaza breaking through all the suffering trying to send their voices to the world. Can you imagine how much these ambitious Gazan artists can achieve with a little more resources and support? You can hear all of Revolution Makers’ music on their Soundcloud or YouTube. I highly recommend it. CHILDREN OF PEACE’S ALICE WINS BRITISH 10K LONDON RUN! For the seventh successive year, Children of Peace sent a team of 12 enthusiastic fundraisers to take part in July’s British 10k London run. Not only did the runners together raise a fantastic £2,647 in individual donations, but there was a personal triumph for Alice Braham, who won the overall women’s race with a magnificent time of 36 min 46 sec, ahead of 6,500 other female runners. Congratulations Alice! The running route passed numerous London landmarks, including Trafalgar Square, Big Ben, Westminster Abbey and 10 Downing Street. All the money raised from the event goes towards upcoming projects that bring Israeli and Palestinian children together so that they can build friendships, understanding and a shared, peaceful future in the region. Children of Peace’s running team will be back again next year. If you’re interested in joining our running team, please contact Dominic at dgamartin@hotmail.com. For many of them it’s the first time they meet a Jew, an Israeli, and that we listen to them,” “They can say everything, and they do – even very harsh things – but they never boycott or attack me. Even in schools, it’s very seldom that teachers say, ‘now you can talk,’ and that they are willing to listen to those things because they have a different sensibility to issues of anti-Semitism. But we don’t have this limitation. Medical success stories from Israel and Gaza The charity Save a Child’s Heart does great work which transcends the region’s political divisions. Recently a lifesaving operation was performed a five year old Iraqi boy whose Christian family had fled from ISIS. His father had originally been nervous about coming to Israel. The father-of-five says the change in Matti after surgery was almost immediate. “He is much more active than before and he has a more relaxed heartbeat”. He has spent the past few weeks in Israel, and asked if his views have changed, say, “Of course – if I could, I would come to live here,” he declares, before adding that he has been telling his family about his experiences, “I wish all of them could come and be here”. You can read more about Save a Child’s Heart… www.thejc.com/lifestyle/lifestyle-features/141105/inside-israels-secret-heart Even when there is no current conflict, doctors in Gaza work in tough conditions with uncertain supplies of drugs and equipment. But one physician working in Gaza, Tarek Loubani, has come up with an ingenious design for a 3-D printed stethoscope which costs just 30 cents to make. Loubani, who has been working in Gaza’s Shifa hospital for several years, heads the Glia Project which aims to supply the blockaded Strip with low-cost medical devices. According to Loubani, Glia was founded when the meagre supply of medical tools during the 2012 conflict between Israel and Gaza forced him and his fellow doctors to press their ears against patients’ chests to listen to their heartbeat. Camp brings together Israeli and Palestinian handicapped youth Rosh Tzurim has hosted a joint summer camp for Arab and Jewish children with special needs for the last twenty five years. This takes place in just before the Jewish festival of Tisha B’Av, and gives children from both communities the chance to play together and make friends. Such Israeli co-existence projects are more usually associated with places such as liberal Tel Aviv. But Rosh Tzurim is a religious settlement in the West Bank, and, as you can read here, sometimes tensions emerge between Jewish and Palestinian participants in the project. www.al-monitor.com/pulse/originals/2015/07/jews-arabs-palestinians-children-handicapped-summer-camp.html# Rosh Tzurim has a long tradition of supporting children with special needs. Its Reishit School works to fully integrate these children with their peers. Each classroom is staffed by a general classroom teacher, a special education teacher and a volunteer from Sherut Leumi (National Service). All pupils with special needs are part of the regular class and are supported with their own individual education program covering the same subjects as their friends with additional input where needed. They also receive occupational, speech and animal therapy, according to their needs. You can read more about the work of the school at www.gush-etzion.org.il/projects/resh1.htm Many Israeli families have moved to the Gush Etzion settlement to take advantage of Reishit’s unique facilities.